Fight like a girl! 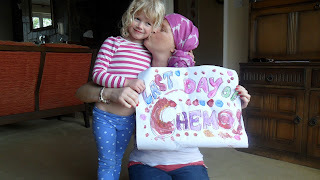 : Last round of chemo......DONE! It now looks like we'll be set to reach 2 milestones by the end of this week, I'll be curled up in my chemo cave counting down the last few days of the fog and this humble blog will have reached 100,000 views! This time last year I was completely oblivious to the fact that those things would be important to me but they both represent just how much can change in 9 months. As if the last day of chemo wasn't enough, it seems that I will now only be having 3 weeks of radiotherapy and have managed to negotiate an early slot at the hospital each day so can get on with relative normality while my chest and neck are blasted with radiation. That means, all being well, treatment will be finished on 26th July! Hormone therapy and the management of my menopause will continue long after that but I'd take them over chemo and radiotherapy any day. I'll let you know how the final round of chemo pans out and look forward to sharing the hair regrowth selfies!